Incorporate your clients into your workflow by assigning them tasks and scheduling automatic reminders for these tasks to be completed. This guide will help your company get started with client tasks. 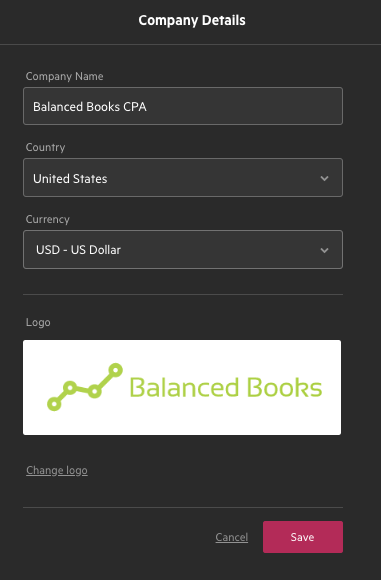 When your clients access their unique view of Karbon, you can display your company logo. So firstly, add your logo so that it’s ready to go. Do this from Settings > Company details. You can add client tasks to any work item, but for the purpose of this guide we are going to outline adding client tasks to a template, which you can then create work from. Go to Settings > Workflow templates and select an existing template which you like to add client tasks to. If you don’t have an existing template, you can create a new one. When you’re in your template, you can create tasks for your clients. At the bottom of your existing tasks, click Add Client Section. You will then be able to give the new client task section a name, which will also appear and add context or your client when they receive these. A new client task section will be created. The tasks you set for a client will be grouped together here. You can add as many tasks as you like, and reorder them with drag and drop, just like you would with your normal. You can also move the client task group around your task list by collapsing it, and then dragging the group to where you want it—at the very top, bottom or in the middle of a section. If you would like to separate client tasks across your task list, you can add multiple groups. To create a new group rather than adding a new client task into an existing group, go to the bottom of your task list and click Add client task. If your existing client task group is already at the bottom, you should first create a new section to separate the groups. 2.3 Fill in Client Task information. Client tasks work very similarly to other tasks in Karbon—you have the option to add a task name and description. You also have the ability to add documents that you want to share with your clients. For the reminder functionality to work, the client task needs a due date. Here, you can decide if it’s due before or after the work start date. You can schedule clients tasks to be sent, so it may be useful in some scenarios for the tasks to be completed by your client before your team begins work. 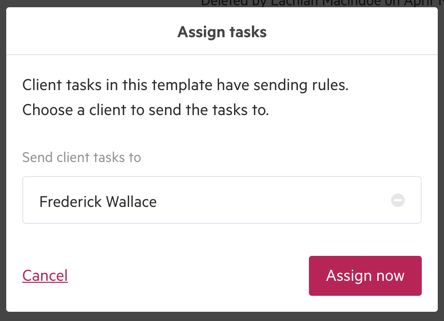 If you would like your client tasks to automatically send to a client, you can set sending rules. As this is a template, you can select a date before or after the work start date, just like the due dates. 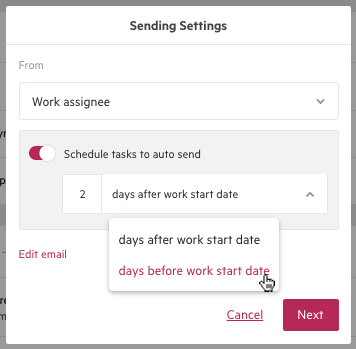 If you would like to manually send the tasks from your work, do not schedule any auto sending rules. Create a new work item from the template with that contains your new client tasks. If you have set up your client tasks to send automatically, you will be prompted to pick who you wish to send the client tasks to. Remember, this needs to be a Karbon contact with an email address. If you happen to have two client task groups in the same template, you can choose to send them to the same person or to a different person. If you have chosen to manually send your client tasks, you can do this by clicking Send to client. Once sent, the client task group will update to show you that the tasks have been sent and when. 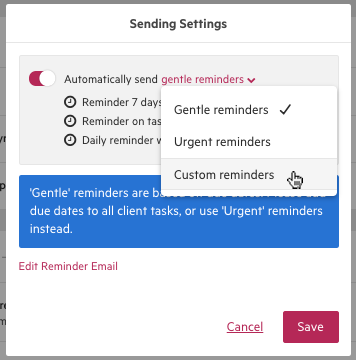 If you’ve set your client tasks to send automatically, they will send on the day you specified. You can always edit this via the options menu (...) and Sending Settings. Once client tasks have been sent, you can resend them at any time by clicking on the options menu (...) and Resend Client Tasks. 6.1 Who is the client email from? If you have set the client tasks to send automatically, the email containing the tasks will be sent from the team member who is assigned the Work. If you manually send the tasks, the email will come from the team member who clicks Send. As the email comes from your own email address, it will appear as a sent email on the related Work and Contact timelines. When viewing this email on a timeline, we strongly recommend that you don’t click on the link to view the Client Tasks. This will ask you to set up a security PIN and if you set this up, your client will not be able to access these Tasks without this PIN. Once the client tasks have been sent, your client will receive an email. When they click on the email link, they will be taken to a unique client view of Karbon that exists for the related Work. They will be prompted to set up a 4-digit PIN. 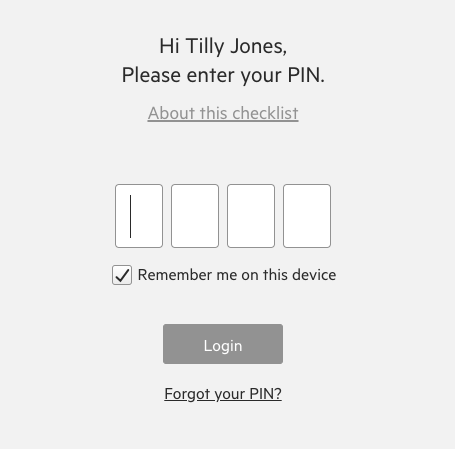 They will be asked for this PIN whenever they access these tasks on different devices. If they forget their PIN they can easily reset it by clicking Forgot PIN. If you have multiple groups of client tasks with your piece of work, you can choose to send them to different people. Each person will receive their own email, be able to set their own PIN, and have their own client view that no other client can see. The staff member who sends the client tasks, and the assignee of the work item that the client tasks are a part of (if that person is different from the sender) will both be notified in Triage whenever the client completes a task. The task on the piece of work will also be marked as completed. If you have turned on reminders for the client tasks, your client will receive reminders until they complete their tasks. Once the work is completed, your client will no longer be able to access their tasks. If you wish to reopen the work to let your client access the tasks, you can. We recommend changing the work status and then resending the client tasks. Here are some client task FAQS that your clients may have.